An alien visitor Klaatu and his gigantic robot Gort, are traveling to Earth for unknown reasons. 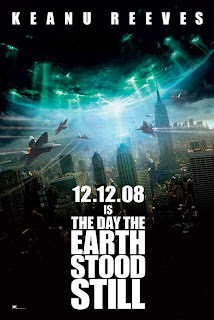 The United States and the rest of the world, expecting disaster with the looming visitor approaching, gather the nation's leading scientists and all available military to Manhattan in order to make contact and discover the reason of the alien species arrival. In the remake of the classic 1951 scifi film The Day the Earth Stood Still director Scott Derrickson (The Exorcism of Emily Rose) excels with the updated look and high powered special effects, but fails in story and overall execution. Derrickson made The Day the Earth Stood Still look really clean and it no doubt excites with its imagery, unfortunately it simply misses the heart of the far better original. Derrickson takes Klaatu's progression of learning about the human race down a different avenue from the remake and the result is bitterly disappointing. The Day the Earth Stood Still's updated look is probably one of the only things going for the remake. No more of the old flying saucers hanging from strings and the robotic Gort, who looked more like a actor in a foil suit, than a indestructable planet destroyer. The 1951 version, definately pushed the viewer's imagination, in order to believe that Gort could destroy the planet on a whim. In the 2008 remake, there is no doubt that Gort can eliminate anything within its path without lifting a finger. Gort in the 2008 film, is a faithful adaptation to what is described of his power when compared to the original and the viewer is instantly daunted by Gort's minimal show of massive power when he does go on the assault. Derrickson keeps the metallic look to Gort, but instead of looking like foil on a suit, he has a sleek metallic exterior that gives the impression of an indestructable being. The cheesy string hanging UFO is also gone, with a light bursting orb the size of a baseball field, in its place. The glowing orb is so large in fact it, needs to land in New York Central Park, just for a big enough space to fit. The landing sequences easily reminds the viewer of Steven Spielberg's Close Encounters of Third Kind, but those memories quickly fade as the film progresses in a much different way. The story to The Day the Earth Stood Still starts off with a great anticipation of what is to come. The looming orb as it approaches invokes feelings of wonderment and once the dramatic landing is finsihed, the remake follows the same path as the original, with Klaatu being shot by a jumpy military gunman. Where The Day the Earth Stood Still goes sour is its departure from the original in Klaatu's exploration of the human race. In the original, Klaatu learns of the human race through his journey of Washington D.C. ending at the Lincoln Memorial. Here in the updated version however, Klaatu learns of a human's compassion and our ability for change through the two he interacts with most, Helen and Jacob Benson. What makes the departure so disappointing, is Klaatu's life lesson comes at the hands of a sniveling and bratty pre-teen, instead of through the powerful words of Abraham Lincoln. The ever frowning youngster Jacob Benson, who ultimately takes the viewer completely out of the movie, is terribly played by Will Smith's son Jaden Smith. Jaden Smith does his best to act like a typical disraught and spoiled pre-teen, but even something that would come so naturally to a boy of his age, feels forced to say the least. His performance is so tedious and grating that any of his relevancy towards the story and Klaatu perception of the human race is lost in the dismal character and portrayal. To Smith's credit, his character is scripted as a brat and really boggs the story down irregardless of the boy's performance. Jennifer Connely who plays Jacob's stepmom Helen Benson, does the best she can with the glum character who mindlessly leads her stepson and Klaatu around. Keanu Reeves is a perfect embodiment of Klaatu. His performance as the emotionless alien being sent to Earth with a eco-related agenda is unblemished. The usual monotone delivery Reeves projects is laughable when it comes to conveying any range of emotion, but here in The Day the Earth Stood Still with the insensitive Klaatu, it is a flawless portrayal in a otherwise flawed film. Keanu Reeves also brings a unique demeanor that is both inviting and callous which beckons an assertive alien lifeform that is gathering information regarding the patterns of humans. Unfortunately, Keanu Reeves's percisioned performance of Klaatu wasn't able to save Scott Derrickson's remake of The Day the Earth Stood Still, like Klaatu has the ability to save Earth. The Day the Earth Stood Still has a vibrant look and all the special effects one would expect of a 1951 scifi remake, but the overall message and heart of the original film is completely absent losing all of its impact. The storyline follows the original with a few key changes, those changes however, detered the film to the point of eluding any interest in the film's outcome. If your persuing an eye-popping special effect extravagnaza void of any real meaning or impact then the remake is a good choice, otherwise stick with the original The Day the Earth Stood Still.